To assist cities, counties, and their divisions in managing yard waste and brush, SCISWA owns a wood chipper that is available for rental at no charge. Any county, city, or municipality within Lucas, Marion, Monroe, and Poweshiek Counties (including Victor, Iowa) and their divisions are eligible. The chipper accepts tree and brush waste up to 18″ in diameter and can be used by communities to process yard waste and brush collected at community-sponsored sites. To reserve the wood chipper, please read this wood chipper information. You may also fill out a rental agreement and the rental request. 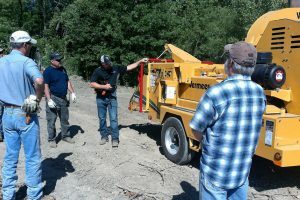 For more information on the Wood Chipper Rental Program, contact Jennifer Frampton at 641-828-8545.